Rugs are one of those home decor items you don’t start purchasing until you’re officially “adulting” because let’s be real — they ain’t cheap! A good rug can run you up to $1,500+ depending on where you shop, and that’s just not realistic for most people. In Canada, If you’re not spending the big bucks, unfortunately, we are left with little affordable options, especially when it comes to buying online. So to save you from searching, I’ve found some fabulous, stylish & affordable rugs for your home that’ll arrive straight to your doorstep! Are US retailers an option? Of course. But... there are a few negatives to consider if you’re purchasing rugs online from the United States. Therefore, I highly suggest purchasing from local sites or from websites that have a presence in Canada. With many budget-friendly options, these Canada-friendly retailers prove you don't need to empty your wallet to add some flair to your floors. 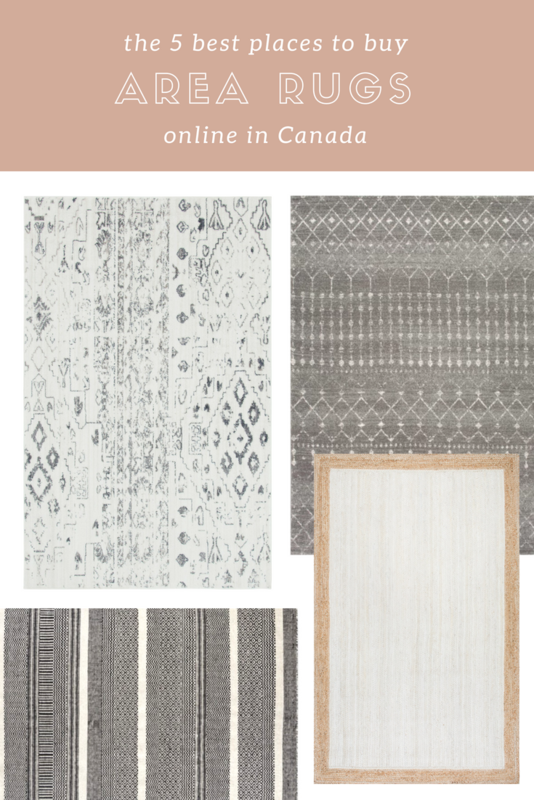 We purchased our most recent rug from Rugs.ca after I spent hours and hours struggling to find a stylish, yet affordable rug on multiple websites. Rugs.ca has over 200,000 rugs in stock and prices are extremely reasonable. My favourite part about their website is that within the product description of each rug, a high-quality video is included showing the texture and colour up close. This is a huge plus because you can get insight into the quality of the rug. Each rug includes free shipping and a 30-day return policy. They have a myriad of styles to appeal to a large demographic. Most rug styles come in multiple colours and styles. I am incredibly impressed with the rug I bought, called the Madrid Rug. It’s super soft, a beautiful pattern and it was really affordable. I’m definitely going to be purchasing again from here in the future. Although I haven’t purchased from Wayfair before, I’ve head amazing things about Wayfair through friends and family. They have a huge selection of over 10,000 rugs which is too many in my opinion. Please limit my choices! (Ha). Free shipping over $75 and a great return policy will make buying a breeze. Urban Outfitters has an amazing selection of cute geometric and woven rugs. These rugs are on the thinner side, so they are great for apartments or layering over carpet which is a pretty popular trend right now. They extremely wallet-friendly and have a variety of fun patterns and designs. If you’re into hippie chic decor, then Urban Outfitters is the perfect shop for you. Our first living room rug is from Structube and I absolutely love it! Although I purchased it in store, Structube is a fantastic online-option. I’m not going to lie, some of their rugs are not cute, but the wool rugs are to die for! The pricing of their wool rugs varies from $300-$500, so mid-range, but they are worth it. The quality is excellent. Overstock is an alternative to Wayfair, they are similar websites, meaning they have a ton of options, various brands and slashed prices. I’ve purchased from Overstock before and I was very happy with their shipping & service. We purchased our first couch from here (a bargain of $700) which lasted two solid years before Dexter (our dog) destroyed it.